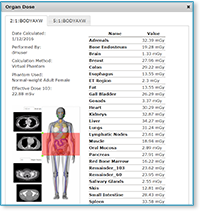 DoseMonitor® is a unique software platform that identifies patients who may be at risk for ionizing radiation overexposure at the time an exam is ordered. Manage radiation dose effectively, adapt to new technologies and meet evolving regulatory standards with the DoseMonitor® PACS-based automated dose data acquisition and analytics system. DoseMonitor® provides immediate enterprise-wide visibility into patient dose exposure for multiple modalities and PACS systems. Capture, analyze, report and take action on the dose information needed to optimize patient dose/image quality today and in the future with DoseMonitor®. The DoseMonitor® PACS-based automated system provides healthcare facilities of all sizes enterprise-wide visibility from day one into patient radiation dose exposure throughout the hospital or health system. DoseMonitor® offers providers the greatest access to and flexibility in how you see, use and export dose data regardless of a hospitals size or configuration or number of modalities, units or even PACS systems. With enterprise-level data acquisition, DoseMonitor® provides visibility into your organization, to aggregate, interpret, compare and report ionizing radiation data.